This post is in partnership with Birch Lane. The products featured are new from Birch Lane, so scroll to the end for direct source links! Hey, hey! I’m so glad you’re here. 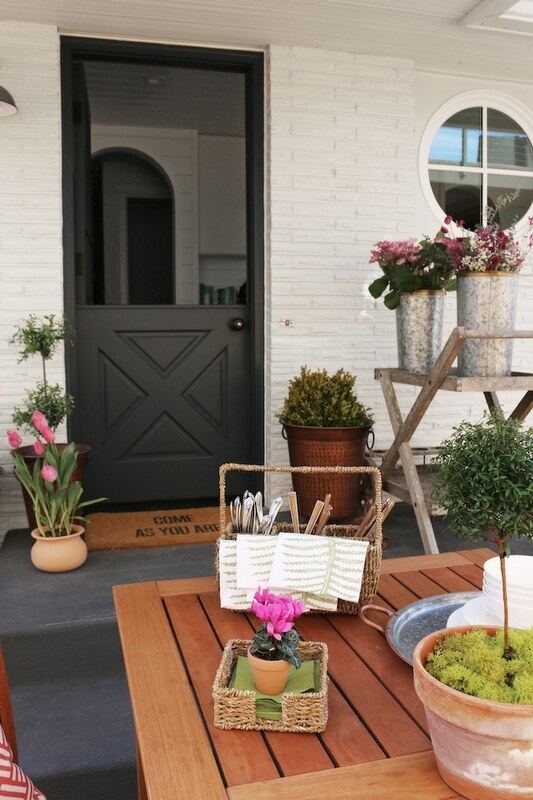 I can’t wait to give you a little peek at the before and progress photos of this side porch area of my home (just outside my newly remodeled kitchen) as well as share some tips for refreshing your own outdoor space. With spring just about here (it is, isn’t it? ), now is the time to start planning a few outdoor projects so you can enjoy every bit of upcoming sunshine. That’s exactly what I intend to do. The side porch just didn’t feel as welcoming as I wanted it to be (clearly even neighborhood cats weren’t welcome here, either, hahahah). I knew with a few cosmetic changes, the porch and our home would have a modern coastal cottage vibe that would suit it and our location well. For those who are new here, our home is on the west coast in the city of Seattle, overlooking the salty waters of the Puget Sound (as well as the Olympic Mountains on a clear day!). With our brand new Dutch door installed, the now painted white brick, new charming light fixture and stained concrete, we’ve made quite a bit of progress already! We still have lots more to do, but even though it’s been slow, I feel like we are on the right track. I’ll let you in on a little behind the scenes craziness from this day we were taking these photos. There were a few sun breaks (which have been almost non-existent since October! ), but don’t let a glimpse of pretty blue sky fool you. It was freezing. And super windy and rainy most of the day. We had to remind ourselves that spring would indeed arrive and by summer we will actually really enjoy being outside in this space. As we were trying to set things up (in between wind gusts and rain drops) our dogs started hopping up on the Dutch door trying to see what we were doing. Our day was made. That is exactly what we dreamed might happen some sunny day if we had a Dutch door. It’s the little things that give us inspiration and make the effort all worthwhile, right? Dreams can come true. I have pictured for a very long time about how we would use this outdoor area. Besides wanting a convenient and clean path to carry and unload groceries into the kitchen, I really wanted a table out here that we would use on a regular basis. I envisioned a charming spot to have morning coffee as well as a convenient place to set up plates and food for outdoor entertaining. 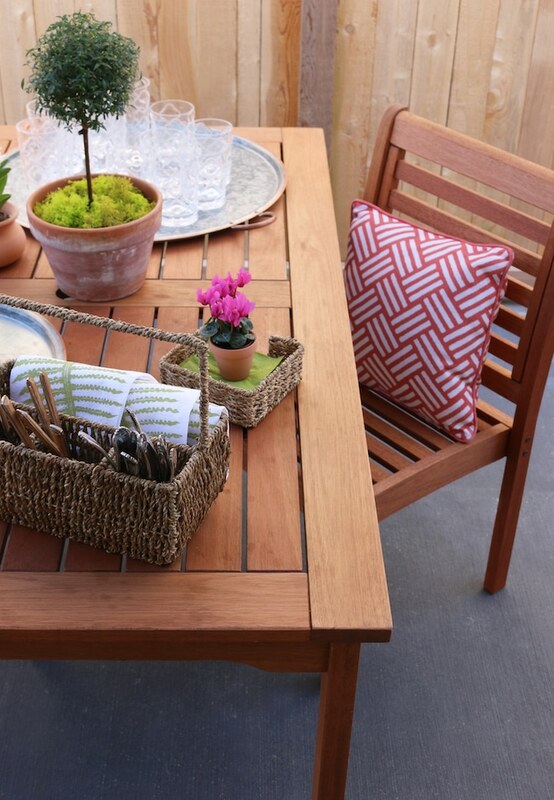 This lovely teak table and quality chairs from Birch Lane are just perfect for outdoor gatherings or quiet mornings. I can’t wait to set it up for our first get-together in this space. 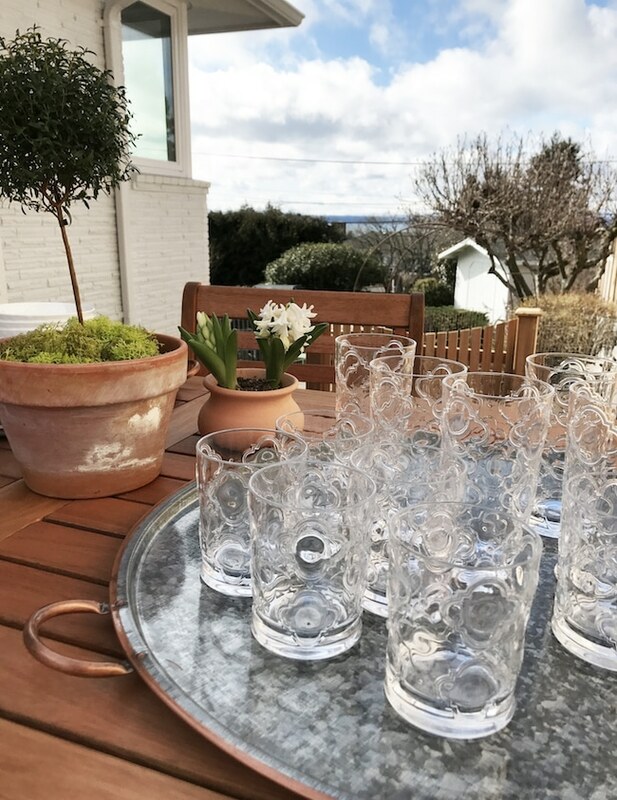 I’m pretty casual when it comes to how I set up outdoor parties (or indoor parties for that matter), but I do like to have pretty things on hand to serve with. It’s fun to make spring and summer parties feel more special without stressing out trying to make it all perfect. Besides a table to gather around, having a conveniently placed table can make a helpful landing spot to bring things out from the kitchen, too. 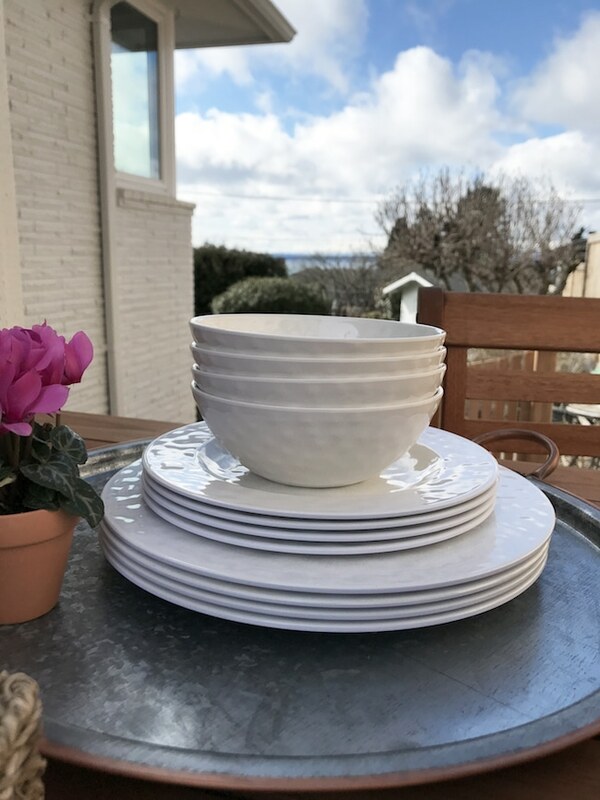 Birch Lane’s melamine plates are ideal for outdoor entertaining with a little more class than paper plates. I love the copper edged trays, too. Since our backyard is down a few steps, being able to transport food to the BBQ is important so I’m excited to put these trays to good use. The serving baskets are also really cute. 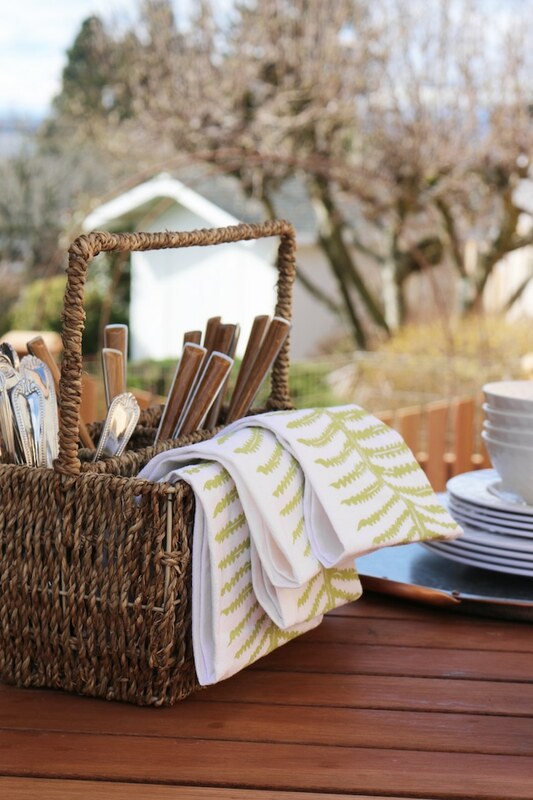 They make it easy to transport utensils and napkins, as well as keep everything together and handy for guests. A set of melamine glasses let you serve your beverage with flair (and another benefit, they are heavy enough that they won’t be as likely to tip over as paper or plastic cups!). I love the design on this set. 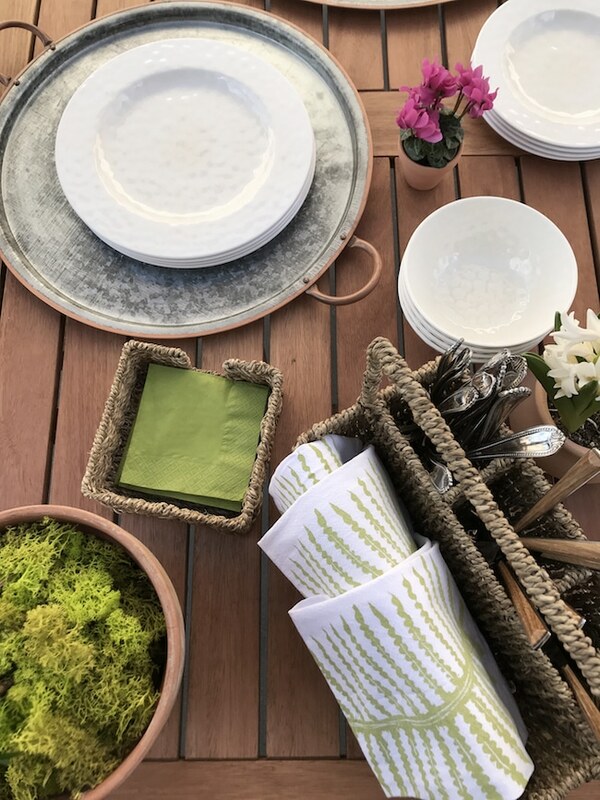 I think with creating outdoor spaces for entertaining, it helps to think through everything you’ll need in advance so you can be prepared and less stressed. But on the day of an outdoor event, you just have to go with the flow! Case in point, it was so windy when I was taking these photos that my paper napkins kept blowing away. Small potted flowers to the rescue. 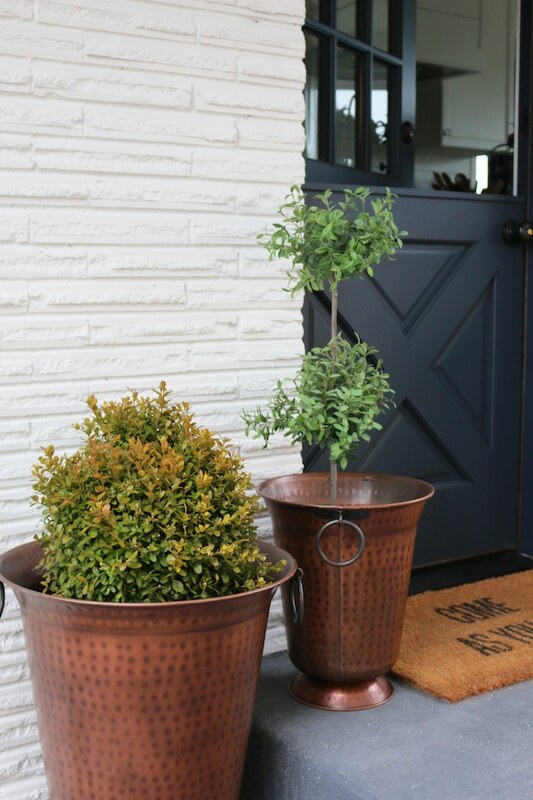 I knew from day one that I would want copper accents to add warmth to the patio and porch. 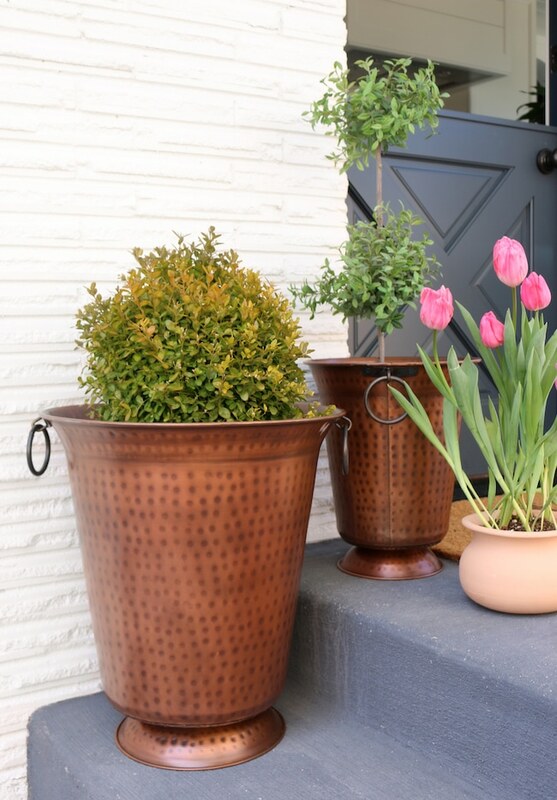 These gorgeous hammered copper planters were exactly the style and additional texture I dreamed about. I can’t wait to shop for plants and flowers that can fill our porch and side yard with the lush look I picture for this space. Not only will I love sitting out here surrounded by green, but I will be so happy to finally see plants from inside the kitchen. Plants can really transform a patio! But don’t worry, you really don’t have to have a green thumb to add some plants to your outdoor table. 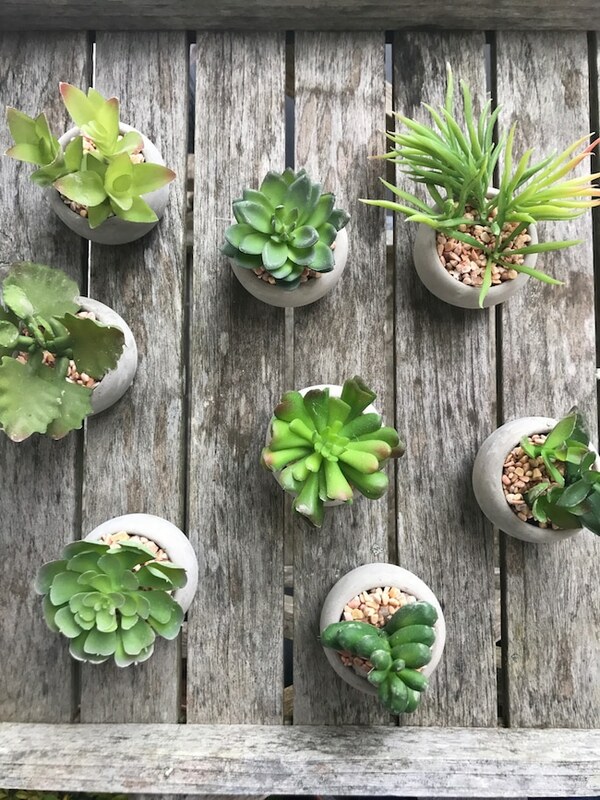 Look at these adorable little succulents. Have you ever seen such adorable little faux plants? You guys, THESE PLANTS WON’T DIE! These are perfect to have ready for decorating your outdoor tables. They’ll never shrivel up and will thrive season after season. 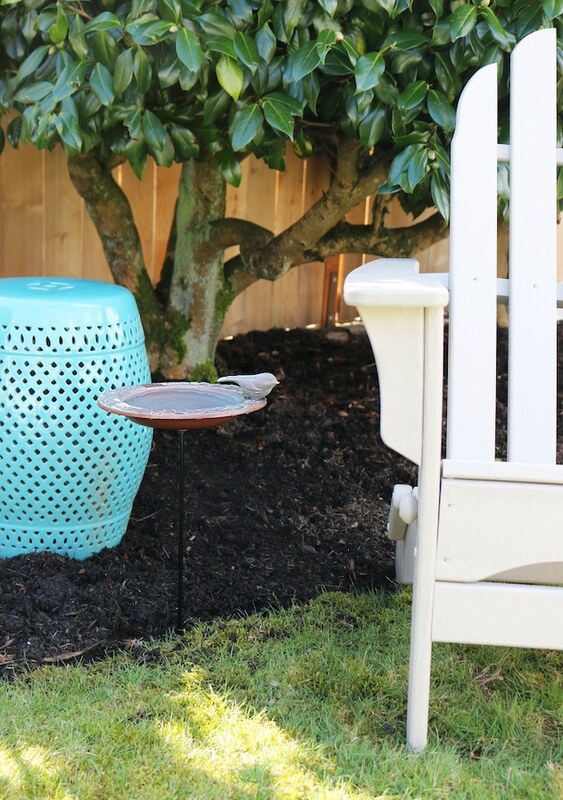 Our yard is filled with birds in the spring-time so I like to add a few accessories to create little outdoor destinations, a place where you or your guests can go to just relax and enjoy nature. I adore this little bird feeder! It would be so cute peeking out from spring flowers, too. Even if you don’t have blooms in your yard, you can enjoy cut flowers from a farmer’s market or grocery store. We have a local farmer’s market near us every Sunday. We love picking up a seasonal bouquet! Don’t stress about creating perfect arrangements, though. 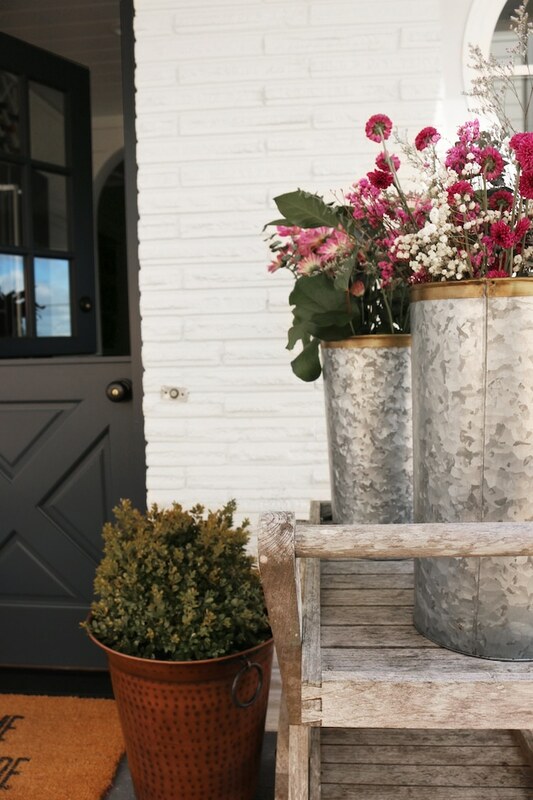 I love the casual rustic feel of these galvanized containers for effortless summer bouquets. 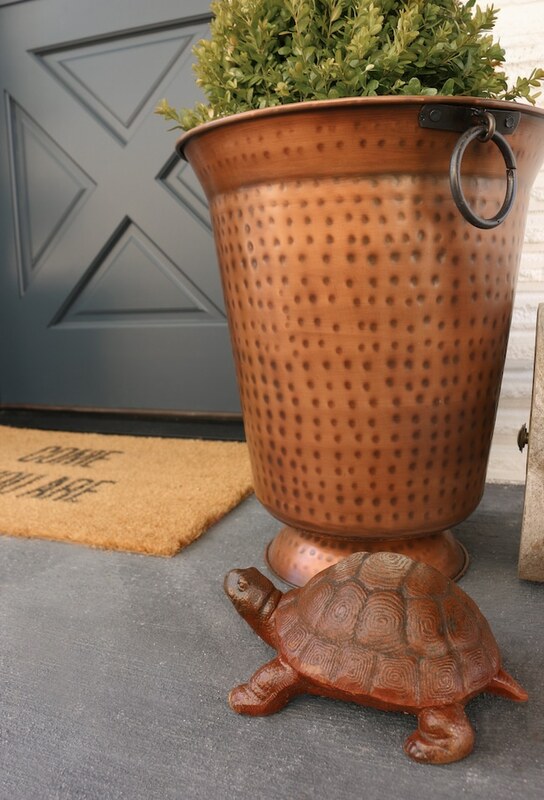 This cute little turtle is a good reminder of what summer outdoor spaces should be all about. It’s all about slowing down and having a place to really smell the flowers, right? Birch Lane offers long-lasting, high quality items that are well-priced, so I’m always impressed by their products. I have several pieces in my home and they have held up beautifully! 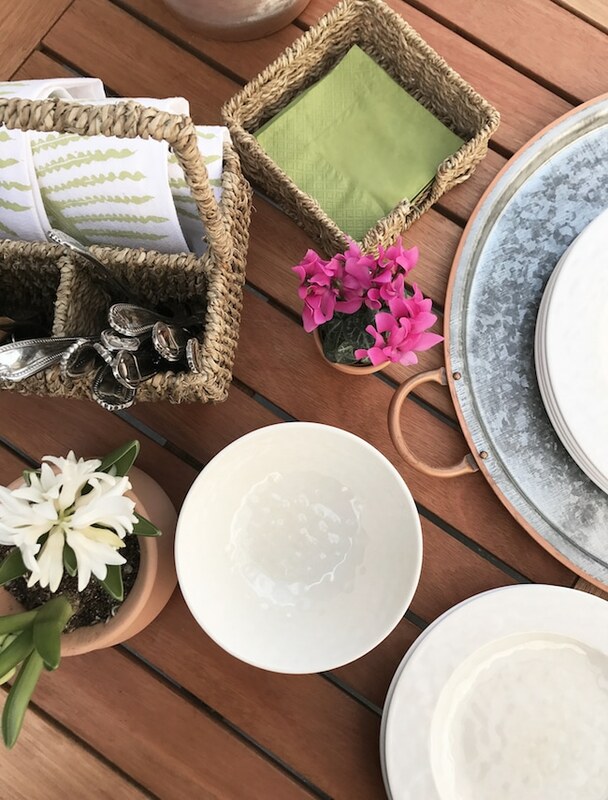 Birch Lane makes it easy to shop online and they offer free shipping on orders over $49, so you can get all the accessories you need to be ready to up your outdoor space. You can shop from items you saw in today’s post via the links below. 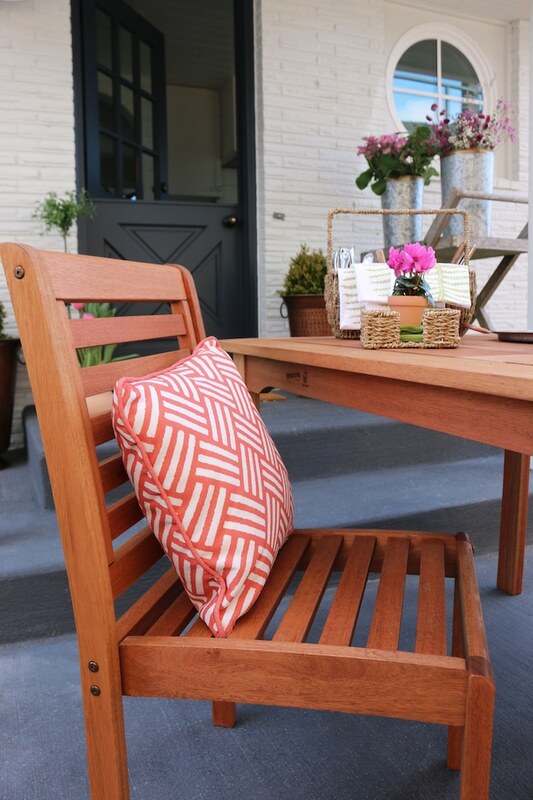 Be sure to check out more of Birch Lane’s wonderful outdoor options here! Other sources from our porch and home can be found here. 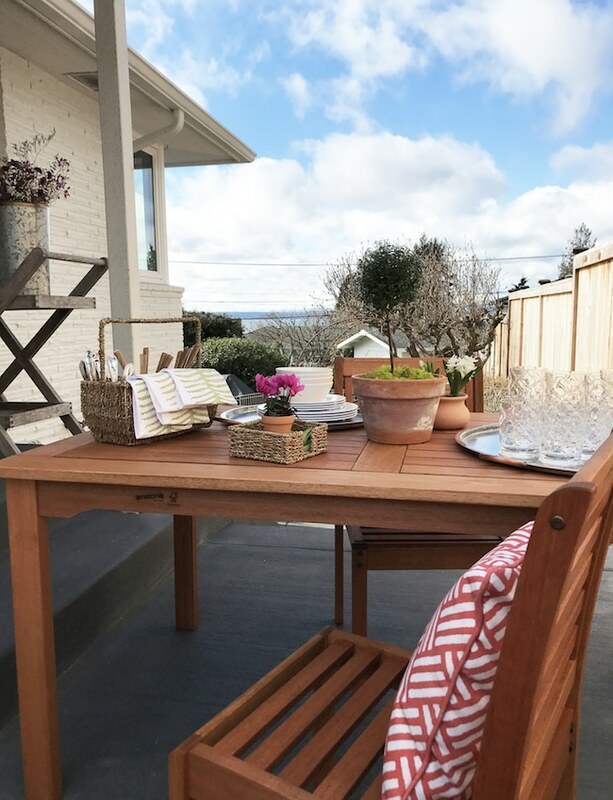 Now that you had a peek at what I’ve been up to in this part of my home, you’re invited to visit two other bloggers who joined me this week in sharing their tips for outdoor spaces with Birch Lane! These ladies are so talented at creating swoon-worthy outdoor spaces, so be sure to pay a visit to both Dear Lillie and French Country Cottage. You’ll be inspired! I can’t wait to show you more of this space. I have a few more updates to show you in future posts (like the new concrete patio, brand new fence and the double gate to our backyard!). Of course we also have a list of projects we hope to get to this year (installing the porch railings and a front gate, potting plants and hanging string lights for a lovely courtyard ambience in the evenings! ), so stay tuned this spring and summer for more developments! What outdoor areas are you hoping to work on this season? PS. I’m over on Birch Lane’s Instagram sharing tips today, I’d love if you came to say hi! Your porch looks very welcoming! I’m looking for some pretty melamine dishes for our travel trailer, so now I will check out Birch Lane! So much is done- sorry have not been here for awhile as we work on our new dream home too. I love all that you have done- the kitchen and the yard and the painting of the brick. The portal window and freshness of the kitchen is unreal!!! You have made the house a home and all in such a short time. But why not? I wonder why people say to take your time but then you have to live less than you want. I am glad you went for it all. Your home has a great karma and will make a real difference to your children and to your marriage. Best! The transformation is amazing on all that you have done. 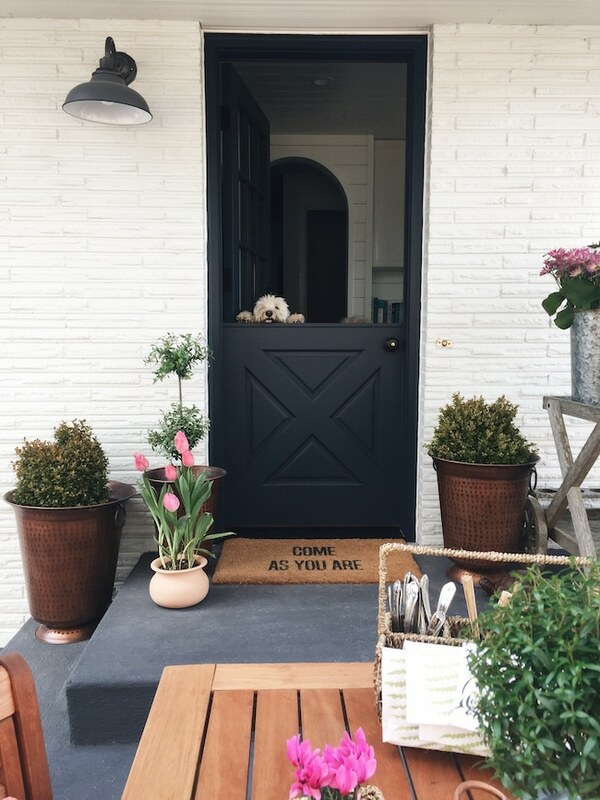 My first thought when I saw your Dutch door, which is so inviting, is this: they must not have to worry about mosquitoes and bugs! I can’t even walk out side without getting bites! That is one amazing before and after. I would love to see more. I like real glass glasses, but we always use plastic by the pool–have to be careful where bare feet are concerned. WOW, looks amazing. I’m so jealous since here in NJ we have snow on the ground. Can’t wait for spring. Yeah. I’ve killed two succulents in as many months. Sigh. 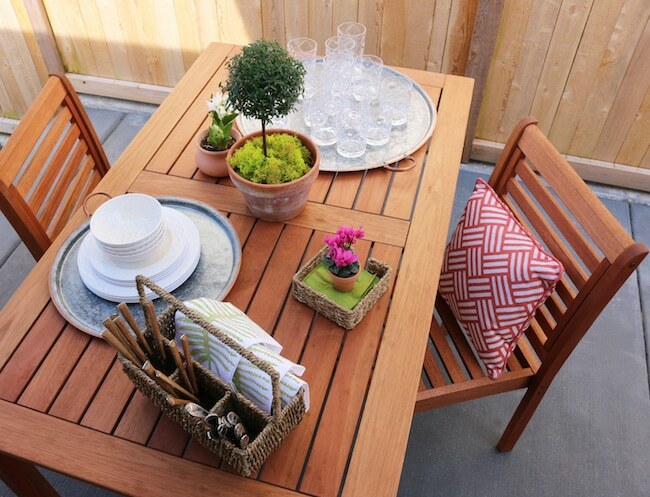 Your little patio area is just perfect! I love your new outdoor area, and the photo with the dogs looking out says “Welcome” so well. Beautiful colors–the contrast between the navy door and coral pillow and pink flowers really pops. Living in Portland, our weather has been similar (WET and COLD) this winter, so spring is very welcome. It’s been so enjoyable to have temperatures in the 50’s even if it’s raining. 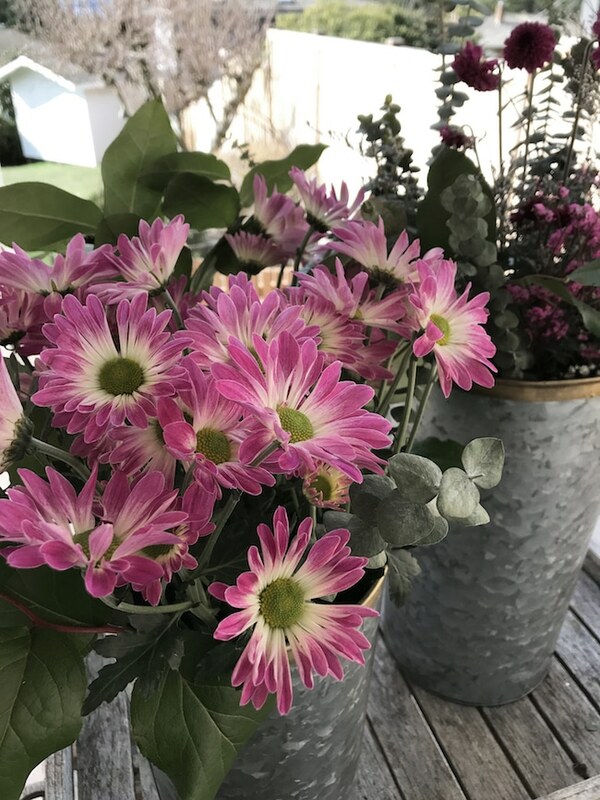 My few walks around the back yard have found my currant bush popping out into bright fuchsia flowers, chives and alliums popping up, a potted manzanita flowering and more… Your space is an inspiration! With all those lovely new touches, I can understand how eager you are for warmer weather. Please tell me more about your stained concrete. Did you spray it on or use a roller? Is this a do-it-yourself project and will you be brand specific, please? We’re in our final efforts of getting our home ready to sell so we can downsize and would love ours to be as inviting as yours. OMG your dogs at the Dutch door are just too cute for words. Can you provide a source for the Nirvana doormat?? Love it. Entire space is just beautiful & so well done as always! Hello! Where did you get your outdoor wall sconce? I have been looking for one and I LOVE the one you chose. Thanks! Can you tell me the paint color of your home, and the door color also! I love it! We are looking to paint the brick on our home and I love this combination! Love your blog! I agree, would love to know your paint color. I have checked through your blog to see if you had anything about painting your house but haven’t found it. We are looking into painting ours and I would love to know more. Ours looks a lot like your before just a little more of an orange tone. Beautifully done! I’d love to know these colors as well. Thanks! Where can I find the doormat? So cute! Thank you! Just ordered one and said I saw it on your blog! I’m on my way over for a cup of coffee…don’t care if it’s cloudy and cold. What a lovely job you have done with your outdoor space. Lovely transformation! Beautiful Dutch door ! Love everything, especially the copper edged tray, really pretty. Do you have a source for that? I didn’t see it listed. So pretty and inviting. And the dogs up the view too! Nice teak furniture, I will be very interested to see how it stands up in NW weather. I assume you will leave it out as seen in the pics. Oregon Mid-Valley had so much rain and unbelievable amounts of snow this year I won’t be surprised if my bulbs and tubers rotted in the ground. All new landscaping last year, so nothing is really established. Hope for the best and replant if necessary. A lovely, livable transformation…the concrete stairs are darker. PAinted? Stained? new altogether? The doormat is prf Ct. Thank you for sharing this just in time for spring! I know your family will enjoy it so much. I have that table and I liked it so much I didn’t want to leave it outside to get weathered and have it in my office next to my desk and it is the best work space table. Maybe someday I will put it in the yard, but for now, it is the unusual table in a home office for this writer! I can dream of sitting outside on my deck but that’s it. We just had a major blizzard here in Quebec, Canada. 14 inches in 24 hours with gusting winds and white out conditions! My deck won’t be ready until early May but I am very anxious to set it up because my glass dining table broke from all the snow this winter and I had to purchase a new one! I am not heartbroken because the other table served us well for 20 years and I was tired of it anyway! It was purchased for my previous house and it was really too big for this deck so now I purchased a smaller table with 6 beautiful chairs. Hurry up spring. Your makeover is beautiful and very inviting. Wow, you are making me totally jealous since I have 40 inches of snow on my deck!! What an amazing improvement over the original side porch, I love what you’ve done! Hope the weather warms up soon so you can enjoy it! Such an inspiring post! I love the dutch door. Score! I tried to find the resource for your “Come As You Are” rug but couldn’t. Did I miss it somewhere? Thanks! I really love the before and after photos. What a wonderful transformation. I have a question about Seattle. (I’ve only lived in the Midwest and the South ) Are there mosquitoes, flies, wasps, and other assorted bugs in the area? We have a screened door onto our deck. We could never have an open door, our house would be filled with bugs in no time. Hi Lisa, nope, there aren’t as many :). There are rarely some mosquitoes, a few flies, a wasp now and then, but even at the worst, it’s nothing like many parts of the country has to face. 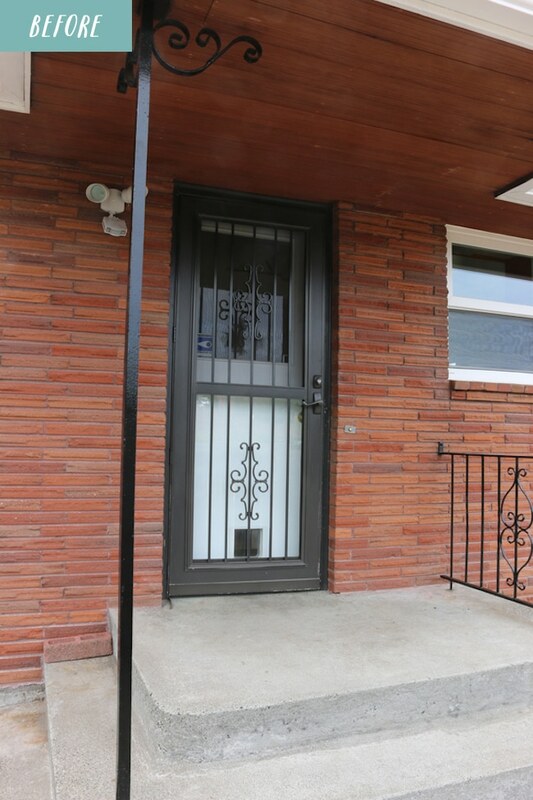 You can use a screen on a Dutch door just like you could with your other door. 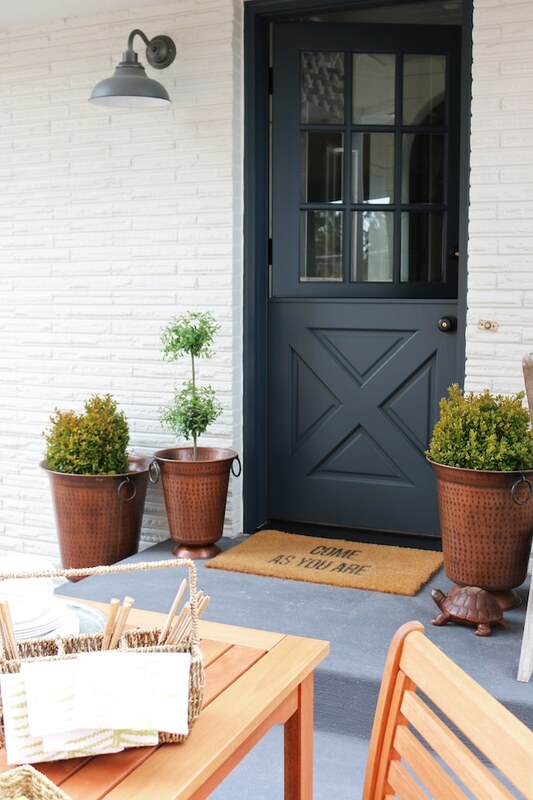 Ever since I first heard (er, read) that you were planning on a Dutch Door, I have been obsessed with the idea! I’m so jealous that you don’t have very many mosquitoes! Thanks for the tip about a screen door. i Love our dutch door! and we don’t get near the view you do, looking out it. no matter, dutch doors bring the happy. That side porch area is looking good! I am needing to work on my deck this year, and I want to create some areas on our property that will be like destinations. We have four acres and while much of it is pasture and barn for our horses, we do have a large yard with no fencing. I need to create seating spaces, and some seating in our campfire area. I’m excited! LOVE everything in particular the furry greeters! Oh my goodness Melissa! Your side porch is lovely…. a tremendous improvement! I am always so impressed with your ideas, as always , you inspire me!! !….oh and the photo of the pups peeking out is soooo adorable!! Beautiful.What kind of paint did you use on the porch cement?We live in New England and have a similiar slab on our porch. The paint we use is always peeling away after rain or snow. I’d like to know more about the concrete stain, too. …Just read that you will be doing a post on the concrete steps! Yay! Love your outdoor area. Please share with me your source for the weathered gray cart. My first visit to theinspiredroom.net. It won’t be the last! I love your new kitchen and spring patio. The first beautiful thing on the patio that caught my eye was the “come as you are” rug. Thanks for providing the link. I think that will be perfect to replace my old mat that never dies made out of black pieces of tire rubber wired together. Don’t ask. I inherited it and have no clue why anyone would design anything so ugly. So this one will dress my doorstep to impress. Beautiful! I Love your outdoor area. Your side porch is lovely. A tremendous improvement! I am always so impressed with your ideas, as always , you inspire me! Very pretty ideas. Even though I fight horrible allergies, I LOVE being and entertaining outdoors. My acre backs up to the woods and with all the birds and critters…just makes me feel alive! 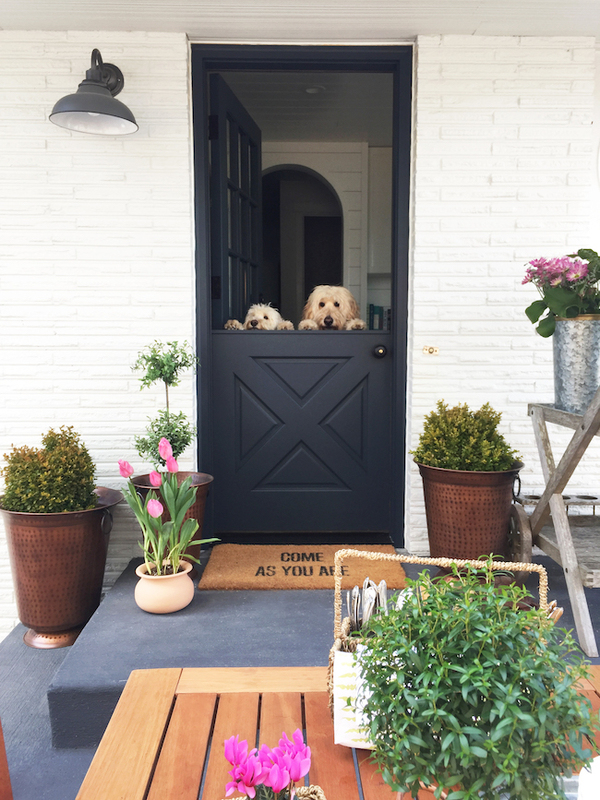 Every time I see the two pups peeking over the Dutch door my heart melts! It’s just the sweetest picture. Thanks for sharing it, and for showing us all your wonderful improvements. I just love your kitchen remodel. Hi – was the table from the same collection? If not, could you provide purchasing information on that — it’s just what I’ve been looking for! Can you send a few more detailed pictures of your wooden planting cart? I LOVE the door. Can you share where it’s from? You did a beautiful job!